Yet another mistake with using Super Spray. 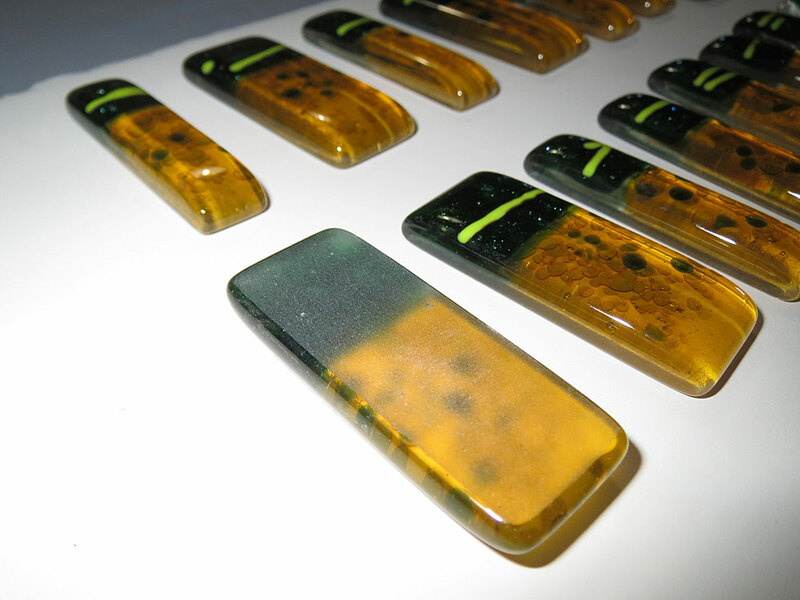 This one came about when fire polishing some fused glass cabochons for jewellery sets. 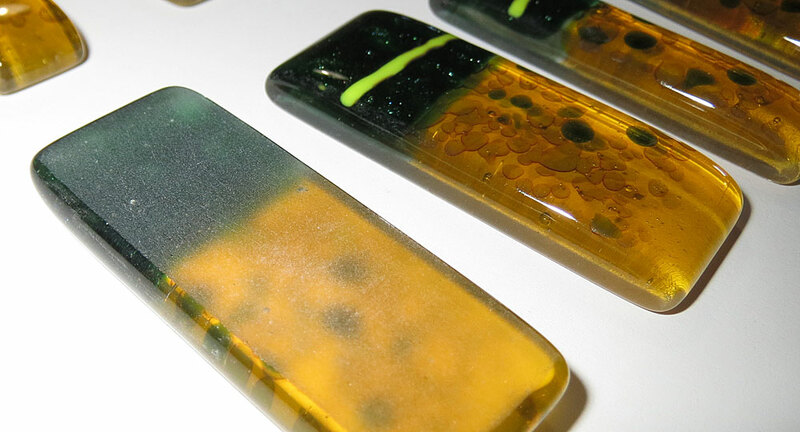 Each set consisted of a single pendant piece and a pair of drops for earrings. When I made them most turned out well, but a few had a little devitrification. 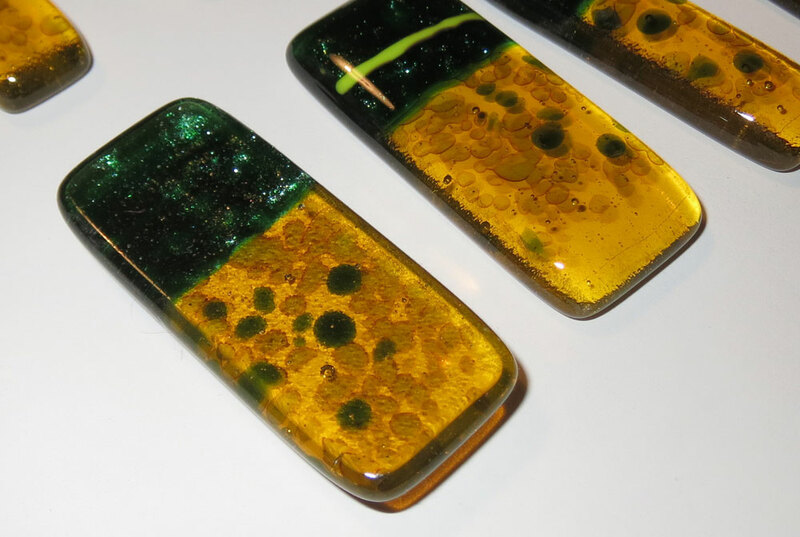 So I decided to grind off the devitrification and fire polish the pieces again. To ensure I would have more success I tried Super Spray. Problem was, I didn’t have a spray unit so I used a brush to apply the solution. In doing this I simply applied too much solution and it run in under some pieces. When they were fire polished this left a stain mark under the pieces. To fix them I decided to sand the bottoms of the pieces with 200 grit diamond sanding block and fire polish again. In this photo you can see one of the cabs turned downside up so you can see the sanded surface. I wasn’t sure how well this would work as I needed to place the cabs with the sanded side down on the shelf to maintain the shape. After firing you can see that my concern was unfounded and the bottoms did polish up beautifully. Be very careful when applying Super Spray. Do not apply any solution to the bottom of your piece. A sanded surface in contact with the shelf will fire polish successfully. Previous post: At last, new shelving for the glass sheets.